(Bloomberg) -- In the U.S. there’s FAANG and in Asia, it’s BAT. Down Under, a burgeoning tech sector has its own five-letter acronym: WAAAX. 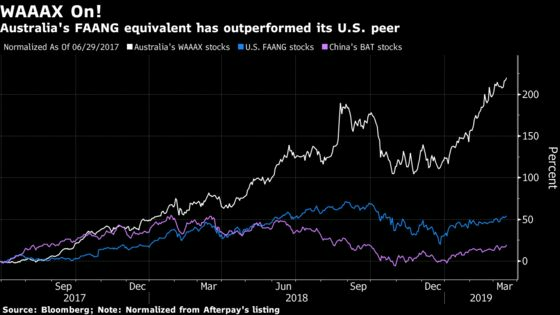 The term encompasses a group of Australia’s better known technology stocks: WiseTech Global Ltd., Appen Ltd., Altium Ltd., Afterpay Touch Group Ltd. and Xero Ltd. And they’ve been good bets so far: WAAAX shares have outperformed their China and U.S. peers as investors sought exposure to the global rally that has sent U.S. tech equities soaring since 2017. The jump is all thanks to the shift to cloud-based technology and Australia’s plan to open 5G networks, according to Camille Simeon, a Sydney-based investment manager at Aberdeen Standard Investments. “Compared to what else is on offer in the Australian market, the WAAAX names have a very attractive growth outlook,” she said. Another reason for the rally is that investors are seeing the success of the FAANGs in the U.S. and are hoping to replicate those gains, according to John Athanasiou, chief executive officer at Red Leaf Securities. But the Australian stocks will need to back up the momentum with revenue to keep the rally going, he said. Xero, which makes cloud-based accounting software, has climbed 41 percent and is worth $A6.8 billion. To be sure, some of the companies aren’t yet profitable and investors need to look at different measures to validate their potential. For Xero, they’re focusing on cash flow as the firm aims to break even within its current cash balance. Afterpay Touch discusses in its corporate filings the number of consumers and retailers adopting its platform while trying to minimize the proportion of its revenue from late fees. The industry has also weathered some big-name letdowns. GetSwift Ltd., a maker of delivery software, soared more than 1,000 percent in the year following its initial public offering at the end of 2016, only to see its stock price collapse after the company disclosed that some of its contracts were only for trial periods. Video-marketing company Big Un Ltd., whose shares surged almost 1,500 percent in 2017, was delisted last year after revelations that some of its customers paid for services with money advanced by one of its investors. Australia hasn’t traditionally been known for tech stocks as financials, energy and mining account for more than half of the benchmark S&P/ASX 200 Index. Tech makes up less than 3 percent of the gauge, compared with more than 20 percent for the S&P 500 Index. ASX Ltd. has seen 67 tech IPOs over the last three years, collectively raising A$1.46 billion, a spokesperson for the bourse said, citing Dealogic. Aberdeen’s Simeon insists WAAAX isn’t just another clever acronym -- the naming is a sign that the companies are becoming more competitive and rattling incumbent positions. “It’s a reflection that these are companies that have been able to disrupt and establish a market position, which they’re now able to build on,” she said.